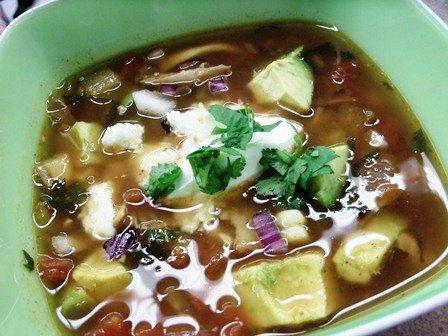 This tortilla soup was a big hit, it doesn’t have a little kick from the ancho powder, you can cut back on that a little. Great for a party with some Mexican Beer or Margaritas!!! Enjoy!! In a large stock pot add 3 tbsp. oil over medium heat, add tortilla pieces and cook, stirring, until browned, 2-3 minutes. Add 1 tbsp. oil more then add onion, garlic, ancho powder, cumin and cilantro. Cook, stirring until spices are fragrant and onion is softened about 7-8 minutes. Add stock, tomatoes, green chilies, corn and bay leaves, bring to a boil, add chicken and lower to a simmer until ready to serve. Season with salt and pepper. 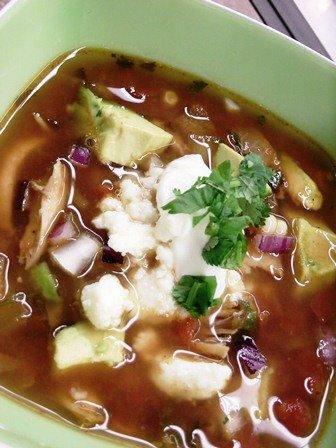 You can garnish the soup with tortilla chips, red onion, queso fresco, jalapenos, avocados and sour cream.